This introductory chapter lays out the investigation, maps the methodology, and provides a summary of the contents of the following chapters. 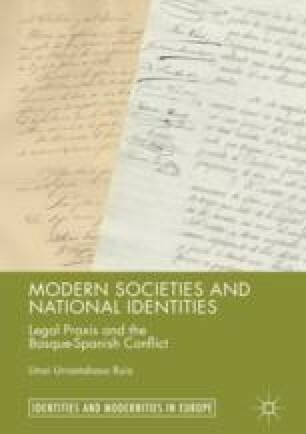 The study is presented as a historical puzzle, one that has generated controversy and that theories of nationalism often struggle to explain convincingly: the diverging historical trajectories of Navarre and Vascongadas within the state of Spain between 1876 and 1936. Due to the relevant roles played by the populations of these territories in war, the so-called Carlist Wars during the nineteenth century and the Civil War in the twentieth, interpreting what factors motivated these populations to act is crucial to understand the social and political conflicts that have defined modernity as well as the formation of the Basque-Spanish nationalist conflict. EncyclopÌdia Britannica Online. (2015). Guipºzcoa. http://www.britannica.com/EBchecked/topic/248956/Guipuzcoa. Accessed 17 Feb 2015.